Has been the most common exchange I’ve had with anyone who knows me over the last couple of months. And the answer is simply, for the love of Douglas Adams. For as long as I can remember, the work of Douglas Adams has been a part of my life. From my Dad introducing me to the book of Hitchhikers Guide to the Galaxy, and then the radio show and TV adaptation, to my brother gifting me four of the increasingly inaccurately named Hitchhiker’s trilogy books one Christmas. And more recently the film adaptation (not everyone’s cup of tea I know, but who can knock Sam Rockwell as Zaphod Beeblebrox or the wonderful late Alan Rickman voicing Marvin the paranoid android), allowing me to bring the world of Douglas Adams to my own kids attention. 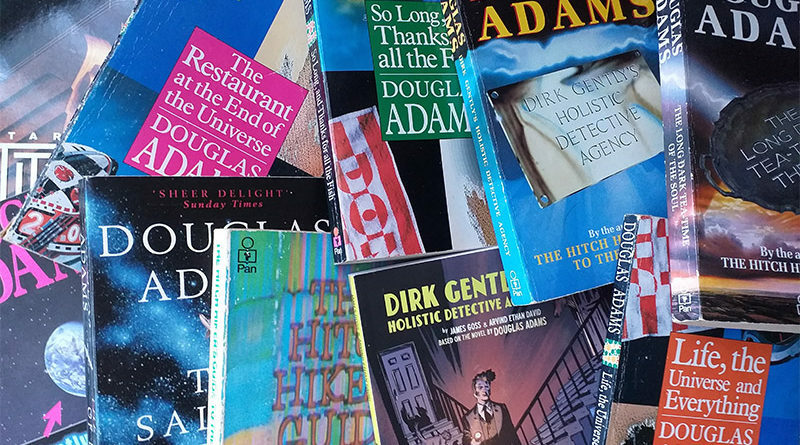 While browsing Samuel French one Sunday morning to feed my serious am-dram addiction I came across the script for Dirk Gently’s Holistic Detective Agency, which found it’s way into my basket and then into my hands. I had read and loved the book, and then seen both adaptations on TV (both the British and US ones), and was now falling for the script, adapted by none other than James Goss and also Arvind Ethan David who went on to produce the US TV series adaptation. “Surely no-one else in our group will like it” I thought, and kept it to myself for a year or so. But eventually I took a chance and put it forward, and what do you know, the production committee said I could do it, the board said I could do it and before you know it I was waiting at the audition like a geek holding a party worrying that no one would turn up. Turns out I’m not the only Douglas Adams fan in our group and I had such a great turn out that I was more than able to cast the play, fill the backstage team and Dirk Gently’s Holistic Detective Agency in Kings Langley started to come to life. All things being connected means that the Universe likes to throw a curve ball every so often and it did exactly that earlier this year throwing my careful casting into the air. But if I knew anything I knew that much like Dirk following the nearest car on the road, safe in the knowledge it would lead him to his destination and if not there, to exactly where he needed to be, I knew we would get there in the end. But more of that next time.